When it comes to money, I am from the “spend less” camp. While saving more and spending less really mean the same thing, the spend less has an implication that isn’t within save more. Save more speaks to the fact that you are saving money, but it doesn’t speak to the part about how much you spend. You can save a lot of money while still spending a lot, lot, lot of money. Spend less speaks to the fact that you are saving money, but it also implies that there is (and should be) a limit to how much you spend. It implies that you are working within a set budget, a cash budget. 1. I spend $150 on $500 worth of products from the grocery store. I save $350, but I spend $150. And I have a lot of products to deal with. 2. I spend $60 on $150 worth of products from the grocery store. I save $90, but I only spend $60. I didn’t save more, but I spent less. And only got what I needed for the week, plus a little for the stockpile. I would encourage you to start looking at your money and your finances from a “spend less” perspective, but the “spend less” mentality into action…and see how much $$$ you have leftover at the end of the month. Coupons.com – print coupons from the Coupons.com website to help you spend less. Red Plum – print coupons from the Red Plum website to help you spend less. Smart Source – print coupons from the Smart Source website to help you spend less. Cellfire – register your store loyalty card and load it up with “electronic” coupons for the products you love in the grocery store. These coupon amounts are deducted from your total grocery bill. Upromise – register your store loyalty card and load it up with “electronic” coupons. Groupon – There’s a reason this is the latest rage. If you’re smart about how you use your Groupons, they can certainly help you spend less! Weekly Meal Plan with Printable Grocery List – the latest meal planning feature. So I forgot how to count…that’s 11, really 12. But whatever…you’ll be well on your way to spending less of your hard earned dollars! I’m right there with ya, babe. Spending less and/or setting financial limits (like a budget!) really has a way of freeing you. 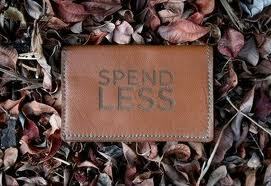 Less stuff to deal with, less deals & coupons to track down, less TIME wasted on buying/consuming/accumulating. I also very highly recommend mint.com. It just became available in Canada a little over a month ago, and I’ve been using it since. I love it! Thank you very much for this post – I needed to read it, it’s awesome to be inspired during the very first week of 2011! thank you you for all the info! very helpful! I’ve been looking into Mint.com as I think it might be good for a very visual person like me. ie: graphs and charts, not just a spreadsheet. DH has concerns over the security, that the site has access into your accounts. Anybody want to share some thoughts or experience with that? Whether that fear was abated, etc.? Thanks! I am SO glad to have found your site! I want to make cheaper meals, which I am pretty good at but $5 meals will be fantastic to have in my back pocket so to speak 🙂 I’m now following you so I don’t lose track of your site. Thanks for all the helpful tips and links! We HAVE to save in 2011. Thanks for posting! I really enjoyed the report coach leather goods outlet . I’ve already bookmark this article. Thanks for the links- will definitely be checking them out! Thanks for this post. This is very useful. I will tell my friend about this post too.